The Maine Hunger Initiative website states Maine is ranked seventh worst for food insecurity, or hunger, in the nation and that food insecurity affects 16.4% of households in Maine. Those are terrible facts. Now, here’s some good news: there is a program right here in Windham that is working to combat those numbers. The Backpack Program runs the length of the school year and supplies food to grades kindergarten through fifth grade. It doesn’t supply actual backpacks, but rather a bag of food that can go home with a child when they need it. The program serves Raymond Elementary, Windham Primary School and Manchester School. 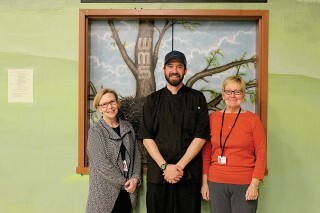 Program director Marge Govoni, Chef Ryan Roderick and Director of School Nutrition, Jeanne Reilly as well as a group of dedicated volunteers help make this program the success that it is. Hannaford had put the program in other schools and approached the district about the possibility of putting it in place in Windham. Early on, there were some funding issues, so Govoni visited Windham Weaponry and asked them for their support. What started out as a program that supported 50 students was able to grow to a program that supported over 150 students because of the generosity of the employees there along with support from the community. Govoni stressed that the unselfishness from the public and local businesses has been great. “If you’re going to [donate] you feel better when it’s to something right in your own community,” she says. The donations are put into plastic bags donated by Hannaford, and the bags are then put into totes which are delivered to the schools, usually packed two to three weeks at a time. Since variety is important, especially in food, the schedule of which foods a student gets alternates from week to week. Ryan Roderick, the new chef for the district, took the position January 1, 2019. He is responsible for working with all the kitchens in the district. Roderick’s job is one of many different hats; the backpack program being one of the hats. He is responsible for quality control and consistency across the schools; “We do a lot of other fun activities...like going into health classes and educating about the food world,” he added. “And the kids love him!” Govoni exclaims. Apart from the Backpack Program there is also the Village Fund which is meant to help those families who do not qualify for free or reduced meals and who may be just a few pennies over the qualification threshold. They encourage every family to fill out an application at the beginning of the school year. And at any time during the school year, when they have a change in economic status, loss of job hours, etc. Reilly, her co-workers and volunteers are aware that a family’s budget can change at any time for any reason. As a team, they are each very passionate about making sure kids eat. “We believe that healthy, nutritious food is a basic human right and that no child should go through the school day hungry,” reiterates Reilly. Windham’s Modern Woodmen of America will be holding a fundraiser from now until April 27. It will be closed at the Travis James Humphrey Music with a Mission Concert at North Windham Union Church where all proceeds will benefit the Backpack program. Modern Woodmen will match donations up to $500! Checks may be made payable to RSU #14; please note “Backpack Program” in memo.